In today’s web environment, your Internet presence must be an extension of your marketing plan and branding identity. In order to drive traffic to your site and expand your business, your custom medical website must cohesively blend image with content and be prominently visible in the online marketplace. iHealthSpot’s comprehensive suite of internet marketing services will increase visibility and maximize returns on your online marketing investment. Even the best looking website is useless if no one can find it. There are literally billions of pages on the Internet and every day, millions of new ones are added. This is why search engine websites like Google and Bing have become so important. However, did you know that search engines need to be told of new websites in order to include them in their directories? Even if yours is included, search engines use sophisticated algorithms to rank websites during searches. Do you know how to make your website rank better for your target audience? The average business owner does not and, more surprisingly, neither does the average website designer. Hundreds of millions of websites linger in obscurity because they are not optimized for search purposes, and the owners of those websites don’t know that the answer lies in a small detail in execution. Our goal is to create visually appealing and functionally complete websites, but also to build a site that is easily found. This crucial detail is one of the most important differentiators in our industry. Many agencies can build beautiful websites, but few have the expertise to deliver good search rankings as well. 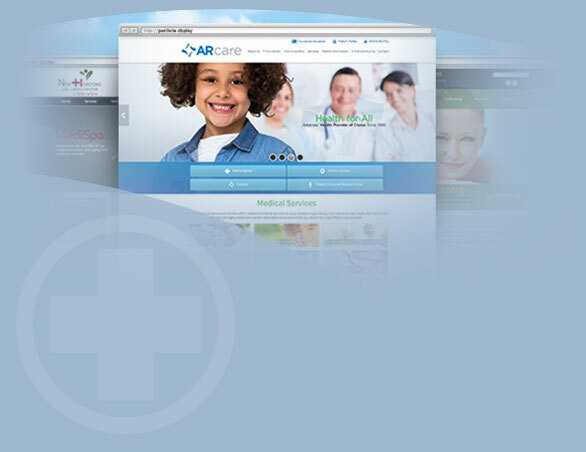 In contrast, every iHealthSpot website comes with on-page search engine optimization included. Every single staff member in our office knows about search engine marketing in every phase of web development. Anyone who performs any work on your website has search engine marketing methods in mind. The result is that our client’s websites are “found” by your target audiences and they deliver new leads and new patients every month. In addition, we offer advanced, off-page SEO services that propel client's to the first page of search for keywords in their specialty and local market. These services include content marketing; custom written blogs specific to your keywords and search terms, and credible back-linking; we ensure that sites in your field are providing links back to your site. See the numerous features included in our SEO services. And learn how our pay-per-click options can grow your practice. Contact us today to learn more about our search engine optimixzation services you won’t find anywhere else. Call us toll-free at (877) 709-0999 and get online today.